The next producer to be added to our “foodie footsteps” mobile app, Paddock2Plate, not only grows pomegranates but produces beef, lamb and eggs as well. We are excited to be adding Cameron Phillips and family of Pomegranate Farm to our growing list of farmers that can be found along our food trails in Victoria and Western Australia (…so far). Here’s a little bit of info about the business: Pomegranate Farm is a small family enterprise using Demeter Biodynamic farming methods. The Phillips family has not used chemical pesticides, herbicides or artificial fertilisers on the property since moving to Barmah in September 1991. 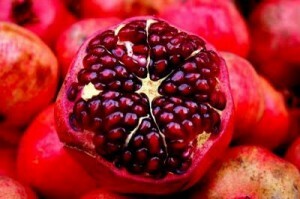 Pomegranates are ripe from late April through to May and June. Beef is available from June and lamb is usually available year round. Eggs from pastured hens are still a developing enterprise. The Phillips’ will be looking at pasture-raised meat birds in the future. For producers… this app promotes and supports your business, while boosting the local economy. For everyone else… this app will assist you in finding farm gates and embarking on food trails where you can purchase produce directly from local farmers throughout the state. Download the FREE app from the App Store today and start planning your next “foodie” trip in rural and regional Australia. Spread the word about this app on your social media pages and don’t forget to tag us. There is a ‘From Paddock to Plate’ Facebook page, Instagram account (@paddockproduce) and Twitter feed (@paddockproduce).